The only one wearing tights for a change! That was hard work. Hills, wind, hills, wind, hills, wind, finish! I entered the Scottish National Road Race Championships back in January after doing a few crit races and fancying a go at a road race. I never quite got round to doing the training for it though, enjoying the crit racing, running and general chilling out a bit too much. Nevertheless I thought it would be a good opportunity to find out what the competition is like should I fancy having a proper go at it next year. We travelled up to Ayr a few days early to ride around the course: 3 laps of a 17 mile undulating (read: hilly) loop with a good wind coming off the sea. It was going to be a challenge for everyone, no matter what speed they tackled it at. Come race day, fortunately the weather forecast was wrong and instead of heavy rain and strong winds we had light rain and moderate winds. Lap 1 felt fairly steady, I stayed in a good position, responded to attacks and had a go myself which didn't amount to much. On lap 2 Lorna Ferguson got a good gap and no one was chasing, so I bridged the gap without taking anyone else with me. Then Jane Barr (last year’s winner) came past, fast, so I jumped wheels. This was THE move and brought all the big guns out of the pack. Coinciding with the biggest hill on the course this blew the race apart. I held on for about 30 seconds before my legs gave way and I ended up riding with Lorna with 5 girls up the road. 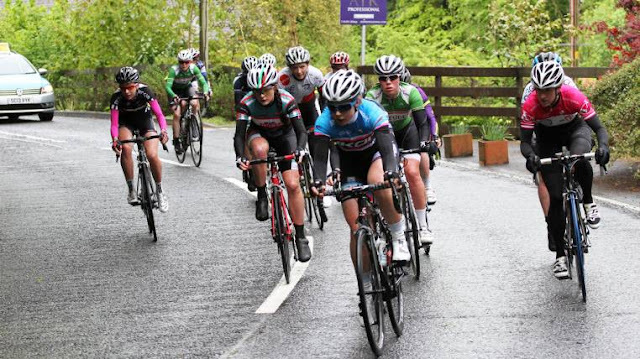 Once we'd recovered a bit, we worked well together and caught Ashleigh Fraser who'd been dropped by the leaders. Time checks from the 13(!) motorbikes were useful and for the next lap we were 1min down on the leaders steadily losing time and 1min up on the main bunch behind steadily gaining time. Lap 3: I was really getting tired now and when we hit the biggest hill again I lost the wheel in front. With 14km still to go I just had to ride as fast as I could to stay ahead of the bunch. Moderate up the hills so as not to blow up completely and as fast as possible down hills to try and hold the gap. Thankfully I managed it and after 84km and 1227m of climbing, I crossed the line in 7th, absolutely spent. Mechanic, masseur (yeah right!) and emotional support in tow (otherwise known as the husband) I arrived at York Racecourse ready for my first ever road race- the Women's Tour de Yorkshire. 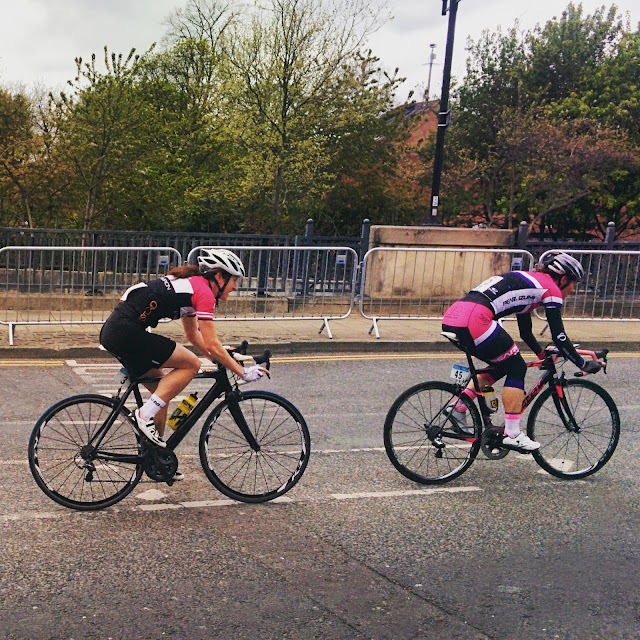 In fact, not really a tour, more of a circuit race around York. But at 4 times round a 20km loop it was to be the furthest I'd ever tried to go fast on a bike for, by a considerable distance. Luckily I spotted team mate Amy Souter almost immediately who was also just arriving, so we set up an albagirls team car base camp. Team Pearl Izumi clearly looked to us for inspiration and parked up nearby, a few more spare bikes and slightly smarter paint jobs but generally pretty similar. At sign in we found the third member of our team Suzie Richards and collected our race numbers 1, 2 and 3, good start! Coffee, gel, warm up, clothes on, clothes off, on the start line, off we go. I managed to get a good spot on the start line, at the front. My aim for the race was to try and stay in the top 20 places at all times. I found it easier than I thought I would to get up to the front, but more difficult than I realised to stay there. I kept drifting back through the field and then moving up again (in hindsight wasting valuable energy in doing so). I made it round 1 lap yo-yoing up and down the field but early on in the second lap I struggled to move back up and eventually dropped off the back of the front pack completely. 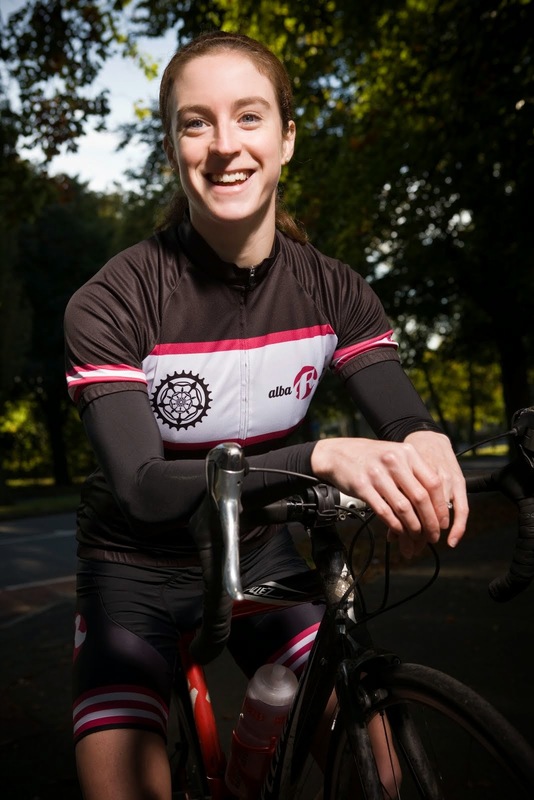 A small chance to get back on arose when Dame Sarah Storey(!) came past, I managed to get on her wheel but couldn't hold it all the way back to the pack and so ended up forming a group with around 5 other girls. We worked together over the next 3 laps, sometimes losing people and sometimes picking others up until on the final lap there were 3 of us left trying to work together/beat each other/make it to the finish line. Just before coming into the finishing straight my little group caught Suzie’s group and a couple of girls jumped away and sprinted for the line. There was zero sprint left in my legs so I just tried to keep moving and use up every last little bit of energy. It was a great feeling to have made it all the way round and share the moment with my team mate Suzie. We also spotted Amy in the crowd who unfortunately got caught up behind a crash. One final memorable moment was cycling back down the finishing chute to get back to race HQ. I think most people had already gone back, so Suzie and I ended up cycling down together, with Suzie egging the crowd on to give us a cheer, they waved and clapped as if we were the winners, brilliant fun. This winter I decided to have a go at a new sport: Cyclo-Cross. I had heard of it before, but I didn't really know much about it. 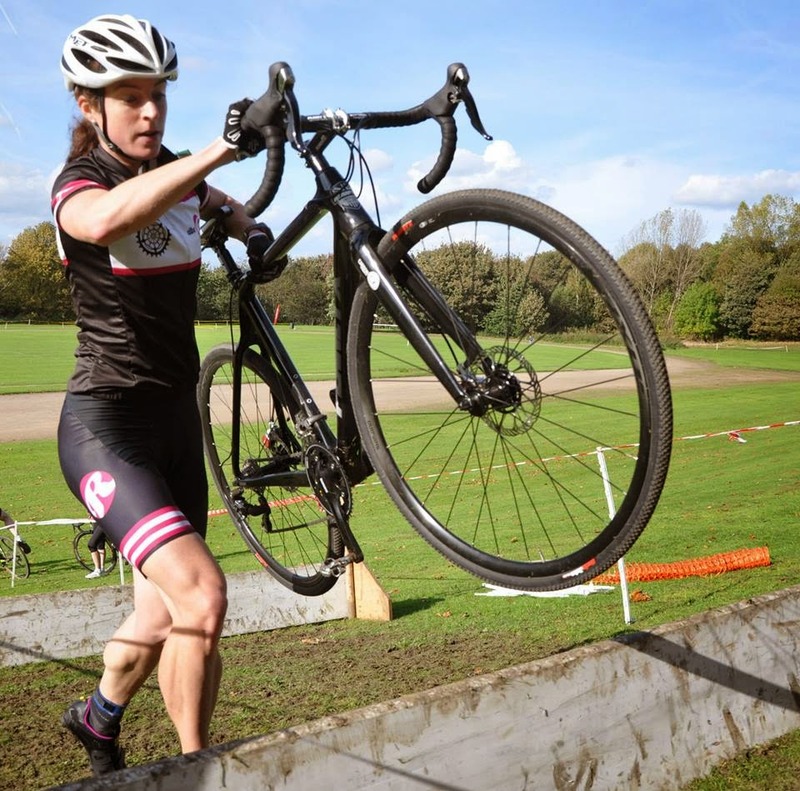 I thought it was a mixture of cycling and cross country running, both of which I have done before and I knew it also involved getting on and off your bike as quickly as possible too, which I'd also done before for triathlon transitions. So I bought a cyclocross bike (similar to a road bike but with disk brakes and knobbly tyres) and entered a race. I decided to start with the novice race at Temple Newsam, but unfortunately I got two punctures and only had one spare inner tube with me so I only managed a couple of laps before I had to stop. Luckily I had time to go home for more supplies and come back for the women's race in the afternoon. I found the section through the woods tricky with lots of tree roots to negotiate, but as the rest of the course was short grass and not very muddy I managed OK and finished 9th woman, just avoiding being lapped by the lead women Annie Simpson and Amira Mellor, who I didn't realise at the time, but are brilliant cyclists finishing 8th and 4th (1st Junior) at the National Cyclo-Cross Championships this year. 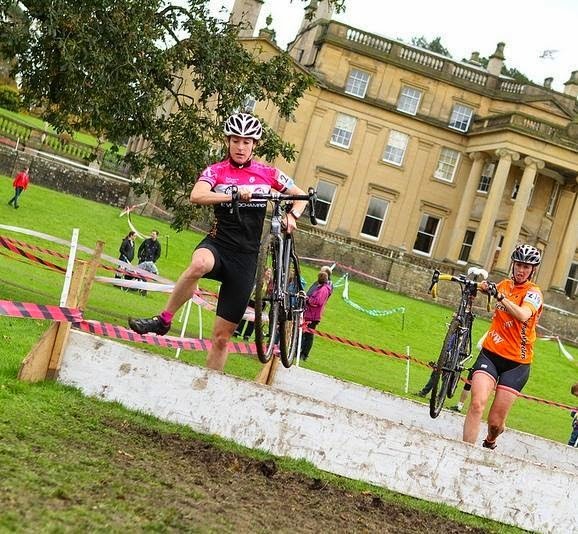 I found the race at Skipton a lot more difficult, I was sliding all over the place and probably ended up doing more running than cycling! Watching the elite races later in the day, I realised this was not the fastest way to get round the course as they hardly did any running at all. Then speaking to other cyclists after the race, I realised my tyre pressure was way too high and the lower the tyre pressure the easier it is to cycle on the mud, a good lesson for my next race. After going round the course to warm up, I nearly didn't start this race... Through the woods there was a narrow bridge to ride over, a fallen tree to climb over and a narrow, muddy, tree-rooty descent. All in all it looked a bit beyond my cyclocross skill level! But after chatting to fellow albaRosa riders Jill, Ken and Richard I decided 'I might as well start and see how I get on'. So I set off quite cautiously, but once I'd made it round one lap I knew I could make it round another five and I started to make my way through the field. I was passing people running up a hill but most of them were coming back past me on the way down again. 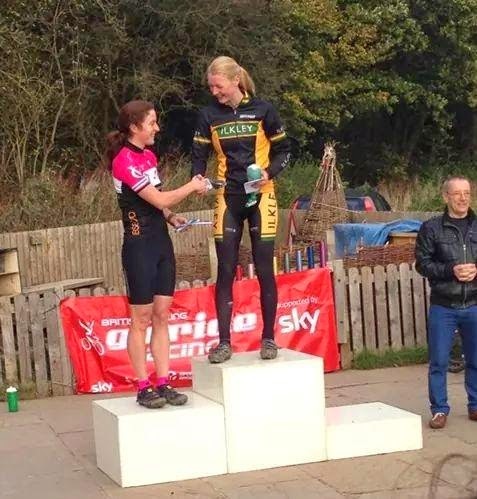 I felt like I was getting better with each lap though and I finished 2nd woman, my first cyclocross podium. 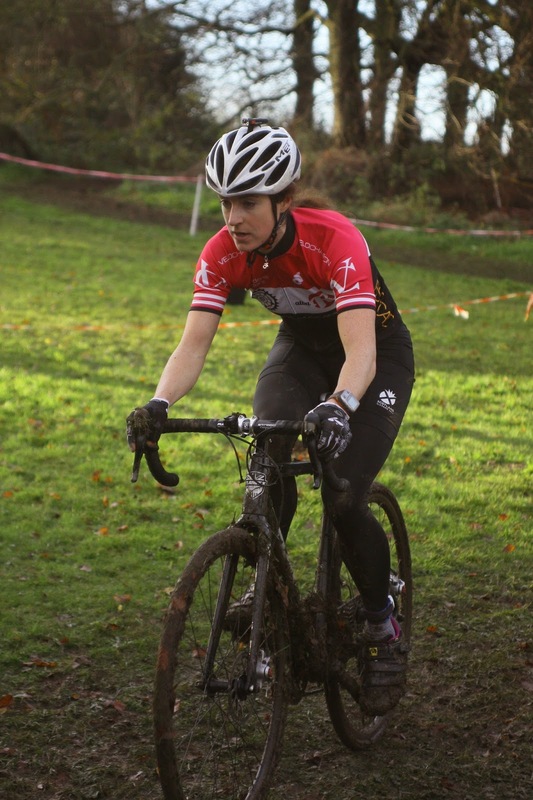 The course at Sheffield was very muddy by the time the women's race came round. There was an uphill start and without going for it I found myself near the front. I felt a lot more comfortable in the mud this time and despite a couple of falls on the first lap on slippery corners I felt strong and was starting to enjoy myself. Unfortunately my bike wasn't enjoying it quite so much and each lap was getting harder until I couldn't actually turn the pedals round any more. Worried that my bike was broken I wasted a lot of time running around the course until I got to the pits to ask for help. Turns out it wasn't broken it was just very very clogged up with mud. Another lesson learnt-if you don't have a spare bike to change onto during the race (a strange practice that many people used in this race) then carry your bike over the super muddy bits and try to scrape some of the mud off at the same time. So a mixed set of results for my first attempts at cyclocross. I enjoyed the challenge of doing something quite different to what I'm used to-having never ridden off road before! And I certainly found the technical sections very difficult, but I think the mud and the hills actually suit me quite well. It's back to the road for now where I plan to do a few circuit races, road races and maybe some time trials, but I'll definitely have another go at cyclocross next winter. At Skipton I won a free entry into another Freebird event so I decided to enter the very next one which took place the following weekend at Allerthorpe, the Sundowner Sprint Triathlon. This was again a course I had done before. The last time I competed there though was back in 2011. I remember overhearing someone commenting on my result "Look this girl must have got a puncture, she had the fastest run and swim but was almost last on the bike". Actually I didn't have any mechanical problems I just hadn't done much cycling. This time my cycling matched my running and swimming so a bit of an improvement from three years ago! 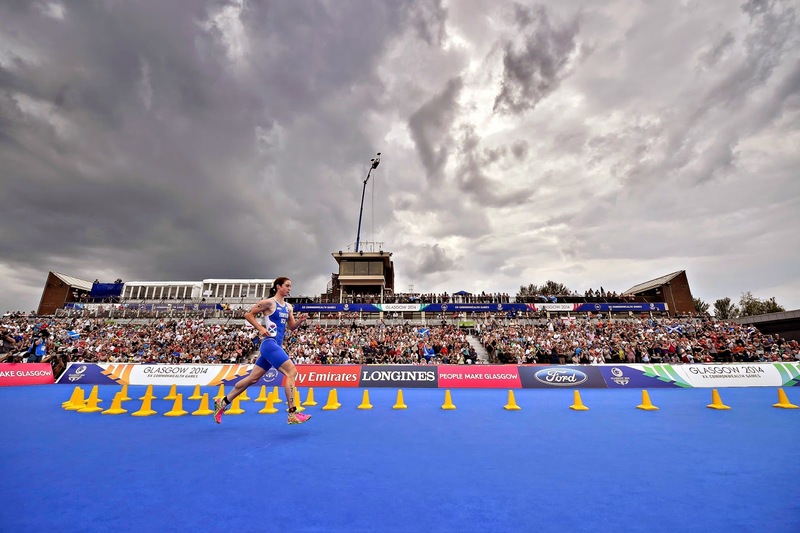 My next triathlon and my final one for 2014 will be a European Cup race in Madrid on the 21st September. "This is it, this is really it, this is what I've trained for, this is the Commonwealth Games". These were the thoughts going through my mind as I dived into the loch in Strathclyde Country Park on Saturday 26th July 2014. For the first few seconds it seemed a bit surreal that after days, months, weeks and years of training the moment was finally here. 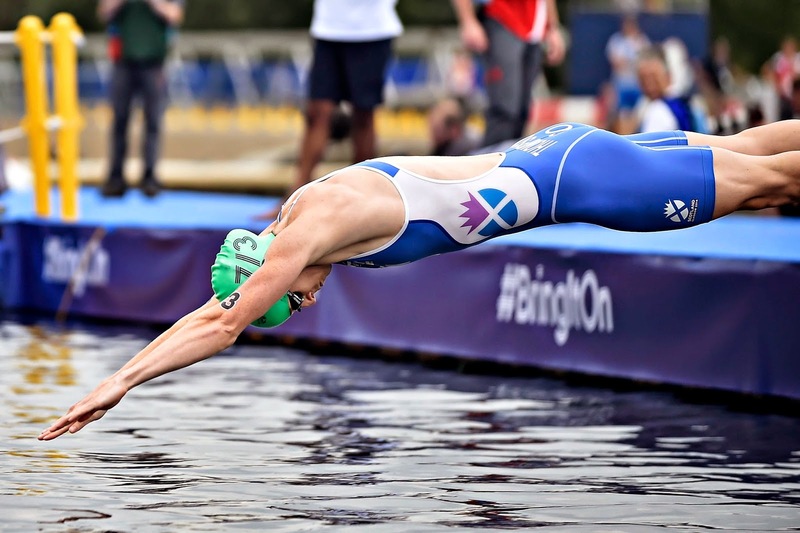 But I quickly refocused on the task in hand, to swim, cycle and run around the Commonwealth Games Triathlon Relay course as fast as I could. 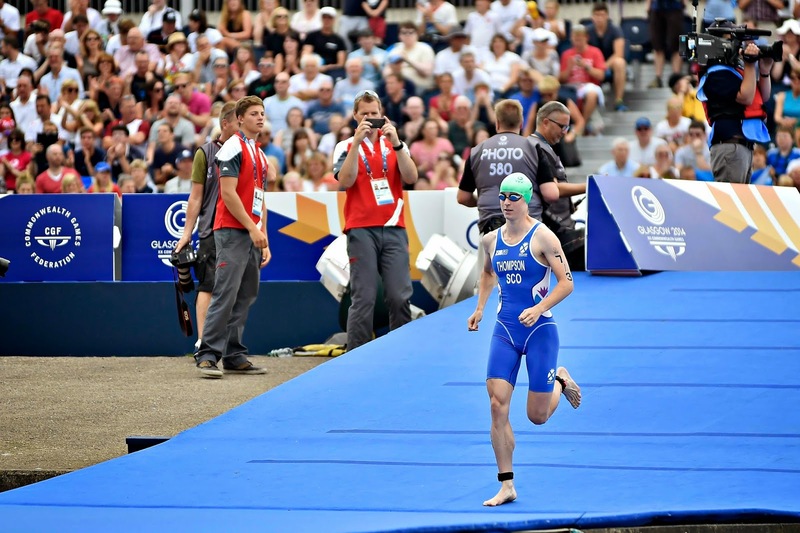 As soon as I came out of the water I was hit by the noise from the crowd. Coming into T1 I focused on what I had to do. Hat and goggles in the box, helmet on, bike out, run run run, jump onto bike, feet into bike shoes, pedal pedal pedal. Then I heard the crowd again as I tried to push as hard as I could round the bike course. I spotted a couple of people I knew in the quieter areas and I heard my Aunty Clare cheering on me. Back into transition, bike in, helmet off, run shoes on, run run run. "This is it, everything you've got, oh no my legs hurt, I can't keep this up, just keep pushing, I'm going to have to slow down, just keep trying, all the way to the end, every second counts". After the race we cycled back to the hotel, showered, changed, attended a Triathlon Scotland reception and finally headed back to the athletes village for dinner and then the bar for our first alcoholic drink in quite a while. One was enough. I stayed in the athletes village for the remainder of the Games, soaking up the atmosphere, watching other events, having my nails done in the village salon(!) and of course making the most of the 24 hour food hall. The closing ceremony at Hampden and following Team Scotland after party were brilliant and the perfect ending to an amazing experience which I'm still happy to recall minute by minute to anyone who makes the mistake of asking! Thank you to everyone who has supported me, especially husband Jamie and coach Jack. Thanks also to Jamie Simpson/Herald & Times for the photographs. 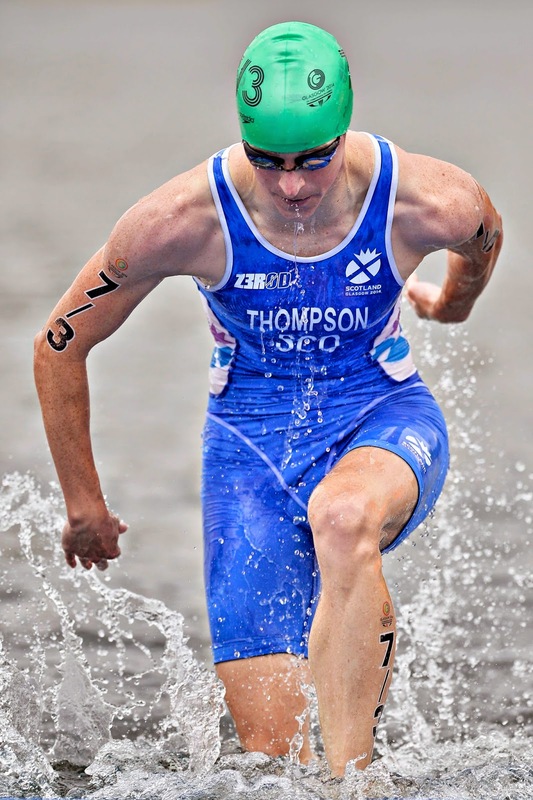 Represented Scotland in the triathlon relay at the Glasgow 2014 Commonwealth Games. Now doing a bit of cycling.